This ebony beauty is one of our Hurricane Gustav dogs which means he survived a horrible natural disaster along with his other buddies: Buttercup, Sharky, Spot, Sweet Pea and Tiki. With the help of Best Friend’s Animal Sanctuary who made the long drive out to California, in the middle of the night, they brought us our latest “hurricane crew”. Now back in his home state of Louisiana, King is a confident and strong willed dog. He does behave around other dogs but does need to be the only dog in the home. 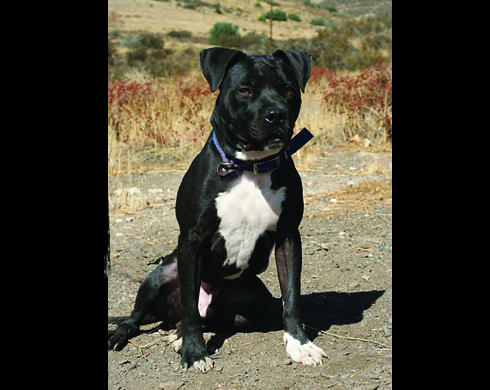 He also has some basic obedience on him and is very intelligent and wants to learn more. He will need an experienced large dog person but he actually does better with women. Don’t get me wrong, he’s not aggressive with men but he will push their buttons. With women he’s so affectionate and wants to please and melts in their lap. So ladies if you’re looking for tall, dark and handsome and you want to feel safe at night, then this guy is YOUR GUY. At this time he is also listed as a Pit Pal due to the fact that it will take a very special and experienced dog handler to bring King into their home. For that reason, it will be difficult but not impossible to find the right home for him.